The all-new Kia Sorento in Odessa, Texas. 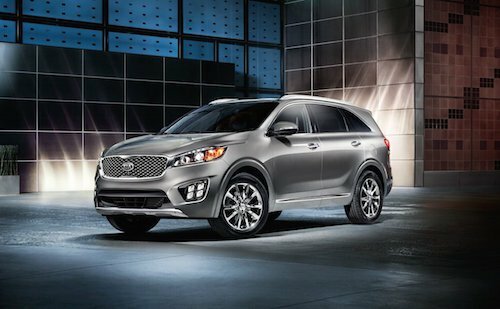 As one of Kia’s most practical and versatile vehicles, we are proud to offer the popular new Kia Sorento in Odessa, Texas. The new Sorento offers a winning combination of sophisticated styling, roomy cabin space and seating for up to seven adults. It is loaded with creature comforts such as a hands-free smart power liftgate, available heated steering wheel, heated and ventilated seats and panoramic sunroof. There is plenty of technology onboard including available blind spot detection, lane departure warning and a surround view monitor system. The Sorento base model starts at around $25,000 and offers a combined city and highway 24 MPG. Our selection of Kia Sorento models has many color options and trim levels to choose from. Browse our online inventory for more vehicle details, photos and specifications. Of course the best way to see if this Kia model is the right choice for you is to come test drive a new Kia Sorento in Odessa, Texas.